Mitte is home to iconic Berlin attractions such as Museum Island, the Brandenburg Gate, Unter den Linden and the Reichstag, all of which are within easy walking distance from our school. Berlin has a wealth of attractions, with something of interest for any visitor to the city, shop until you drop along Friedrichstrasse, watch the world go by as you stroll under the glass roof of the Potsdamer Platz arcade and have your photo taken at Check Point Charlie! 15% off German courses in Berlin! Receive a 15% discount off your German course at our Berlin Mitte school! Accommodation and private lessons not included. 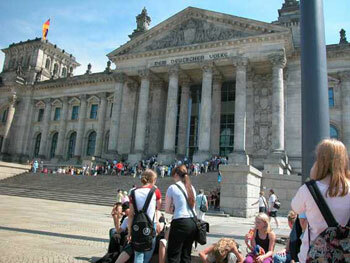 Our German language school Berlin (Mitte) is the smaller of our two Berlin schools. The school is in ‘Mitte’, next to ‘Friedrichstrasse’, the former centre of eastern Berlin, not far from the famous ‘Brandenburger Tor’. This part of Berlin has been extensively renovated since reunification and is now considered very ‘chic’. 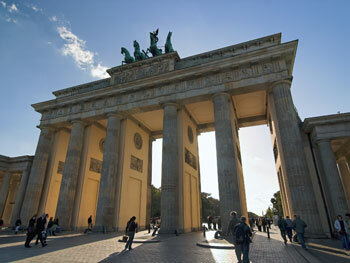 It is also an ideal location from which to explore the rest of Berlin. Our school Berlin (Mitte) has 9 well equipped classrooms and an Internet area with free Internet access for students attending a German language course. There are also multiple balconies outside for students to use at break time. 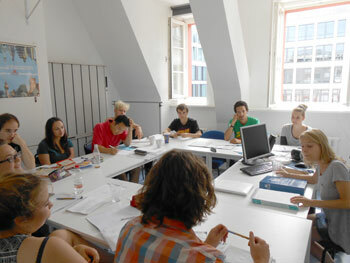 Our Berlin Mitte school offers courses throughout the year. Each lesson lasts for 45 minutes and has a maximum of just 12 students. The Intensive course, consisting of 20 lessons each week and Super Intensive course, consisting of 25 lessons each week are ideal for students looking to improve their overall knowledge of the German language. The Berlin Mitte school also offers a Mini Group course which has just 6 students in each group, which will ensure that your teacher will quickly get to know you, your strengths and your weaknesses. Private lessons are also available, providing personal attention and a more focused approach, or you can combine your 20 group lessons with either 5 or 10 additional private lessons on an Intensive + Private Lessons course. If you are planning to sit a TELC or Goethe examination, you may want to consider our exam preparation course, which will give you all of the skills required to pass these specific exams. Please note that students must have at least a B1 level (intermediate) in order to take this course. Choose the business course if you would like to combine 20 general German lessons with 6 lessons centres around German in the world of work. We also offer an Intensive + Pronunciation course, which is ideal for anybody who would like to spend extra time working on their German pronunciation skills to perfect their accent when speaking the language! If you want to learn as much German as possible during your time in Berlin, you should stay with a German host family, giving the opportunity to practice the German that you learn in lessons. Students staying with a host family can choose between bed and breakfast or half board (2 meals each day). 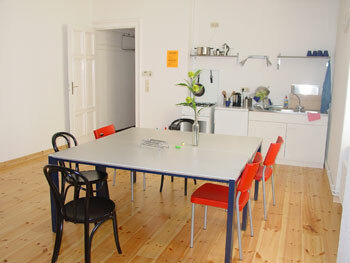 Our Berlin language school arranges accommodation in shared apartments on a self-catering basis. 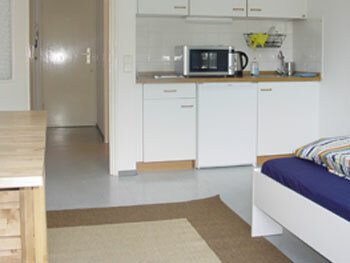 These apartments are shared with other international students or with German students and are located in the heart of Berlin. You will have your own room, but share the kitchen, bathroom and other communal living areas of your accommodation with other students. We also offer a shared apartment plus option, which includes a washing machine, dishwasher and Wi-Fi access. Studio apartment accommodation is also available for students looking for a higher level of independence and the opportunity to cater for themselves during their stay. Our school also organizes a cultural program with a minimum of 3 activities a week. 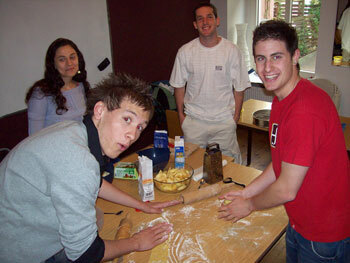 These include guided walks, German film evenings in the school, parties and excursions. This cultural program not only ensures that students enjoy their stay in Berlin, but also helps them learn about Berlin and use the German that that they learn on their language course. Berlin has good international flight connections with two airports, Schoneberg which is located in southern Berlin and Tegel which is located in Nort-West Berlin. If you would like to make your own way to your accommodation on arrival, public transport connections from both Berlin airports are excellent. A transfer service is also available on request, but please note that this service is not included in the price of the programme. Average score for our school in Berlin Mitte based on 28 previous client reviews. The course was very good, the teachers and student were all very nice and helpful. I had a great time in Berlin! My accommodation was perfect! Sandra is one of the nicest people I've ever met and I would like to go back to her one day! My month in Berlin was the best month of my life! I'm missing it already. Super teacher Claudia Unkel....very effective, identified my level, objectives and needs. Was very patient with me despite my repeated errors! Learnt loads in a friendly, relaxed yet focused environment. Was given text book, discs and other learning material on arrival. Excellent. Very welcoming and warm environment in family home (Frau Farsch). Made to feel at home immediately. Breakfast and evening meal very good. Very clean. Good conversation throughout and always helpful in terms of local knowledge/advice etc. Good access to city. Really enjoyed it! This was undoubtedly the best leg of my trip as it combined the best learning/teaching with great accommodation and the city of Munich, good weather etc. I was deeply impressed by the enthusiasm and devotion of the young and energetic teachers and all the other wonderful Germans who did their best to teach me their tough but rich language. 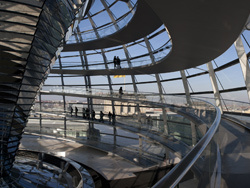 I especially enjoyed the excursions in and outside Berlin. It was very well organised, with various methods (role play, tapes, books, leaflets) used. I was with a very friendly group from several countries, (but not Engliand!) and the level of tuition was about right. I had, and still have, problems with speaking German. At least, it gave me more confidence to try to do so. The course was really entertaining with people from all over the world. The teachers were very competent and understanding, they made everyone feel at ease and I felt I really made a lot of progress during the three weeks I spent there. 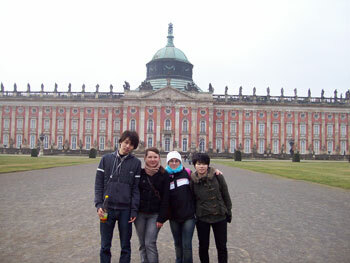 Apart from the courses that were great quality, the school really committed itself to make us enjoy our stay in Germany. Everyone in staff was available, understanding and friendly. I would be really glad to go back there someday. All staff were extremely friendly and helpful right from the start and throughout the course. I felt that the times of the lessons were great providing us time to do touristy and other things in either the evening/morning (depending on which lesson slot you were in). Frau Lahl was great. She was friendly, helpful, fed me well and spoke to me a lot in German, which was exactly what I wanted. Friendly, small school. I was older than other students but I felt quite comfortable. Class was small - only 5 so that was good. Central location was good for sight seeing in the afternoon. It took 30 mins to get to the school, I had requested 20 minutes. Friendly old lady looked after me. A typical old fashioned flat but clean, warm and comfortable. The course was excellent. It was pitched at just the right level for me and struck a good balance between grammer and vocabulary. The accomodation was fine. It was in very central area and had everything that I needed. The school was great. The group class size was perfect and all the students were well placed in terms of language level. This is important since sometimes you can feel held back by others with a lower level. The teacher had us write some text at the beginning to get an idea of where our mistakes were and she focused on correcting these in the instruction time. I thought this was a good strategy. The private lessons were also excellent and well directed. The teachers were patient and knowledgable. Everything was really great! The lady with whom I stayed was very sweet and really tried to enhance my experience. She spoke to me every morning and breakfast and in the evenings she always made time for me and try to think of interesting conversations topics with which to engage me (DDR period, the surrounding neighborhood and its historical development, sight seeing in Berlin, her childhood etc). I will try and keep in touch with her in the future. The course was great, the people were extremely kind and helpful and my teacher was really the best. The accomodation was brand new and thus very clean and nice. The location was perfect (2 minutes walk from the school and 5 to the metro) and my room itself was also fine. The only thing I have as a suggestion is that it might be a good idea to place the students in classes not only based on their level, but also based on what they wish to learn/what their aim is. I never imagined going back to school would be so much fun! In just two weeks my German improved SO much, thanks to the nice and patient teachers at the course. But outside of the school I learned very much as well, both in the city as well as with the other students since we communicated mostly in German with each other. Special thanks to Philippa Taylor and her colleagues for the great service they've provided! My course was very good, complete, flexible and my teacher was very very friendly. Even with other students, the atmosphere was very relaxed and funny, I was also in a quie small group which is very good to speak a lot and feel free. My guest family was very the best ever! So nice and kind with very good meals and, as their family live in Dresden, we (the other student and I) were invited to spend a whole weekend in Dresden which was a very very kind proposal! The accomodation was always clean and welcoming! Interesting and stimulating course material. Lively teaching. Plenty of opportunity to listen, speak and think in German. Pleasant surroundings, with opportunities to go on group visits and excursions if required. I felt really at home and had a very enjoyable time in my accommodation, it was comfortable and conveniently near the S-Bahn direct to the centre of Berlin. I had a thoroughly enjoyable week, totally immersed in German language, history and culture. I certainly met my targets in terms of language-learning and confidence-building, and also made some new friends. I had a great time! Well structured and interactive course. A great learning environment and fun experience. The teachers are knowledgeable and enthusiastic, and strive hard to make the difficult task of learning a new language enjoyable. it was a very well run school, the reception i was given on my first day was very welcomming, the teachers were amazing, professional and fun, i enjoyed my time there very much. The three weeks of learning were very helpful to me, I have a good understanding about the language but its up to me to really study, and lots of memorizing. It was really good as it gave me a change to learn the grammar that I wouldn't have otherwise had the opportunity to learn as it was "too complicated" for school. It was also an interesting experience to have such a relaxed relationship with the teachers who would quite happily start talking in the middle of a lesson (in German, of course). The host mother could not do enough for me - it was almost like staying in a hotel except that I prepared my own meals.